Restaurant business revolves around three basic factors i.e Hospitality, quality and taste. You have to put real energy and effort to maintain these factors for a strong customer base. Because getting customer is hard but keeping them should be easier. Today, there is lots of competition in the market. With each passing day your competitors are increasing and getting stronger. So now a strong customer base has become necessity for you. In the consumer world, daily deal sites have eaten away at loyalty, but now the tech world is making an effort to bring loyalty marketing back in vogue. If a Restaurant business is concerned, the success of business is truly depends on the order numbers that the restaurant receives on a regular basic. So it is very important for restaurant owner need to make effective strategies to ensure customer will come again and again. If customers repeating their visit again and again, means they are happy with your Hospitality, quality and taste. The increase in the number of repeat customers will slowly build a strong customer loyalty leads to growth of the business. We are listing here some ways you should take to develop strong customer loyalty. Ensure fast delivery - Don’t make customers to wait for ordered food. Your home delivery services should be fast. Because nobody in this world like waiting specially when they are waiting for their favorite food. 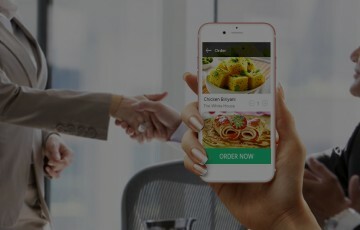 Quick Services - Customer doesn’t want to waste their time now to order food online. If your online ordering system is lengthy and time taking then the consumer will move to another application. So ensure quick order facility for the consumers. Also add quick re-order features where user can reorder previously ordered food with just a simple click. Attractive perks - Providing attractive perks are way best way to attract customers. You can also put attractive coupons to grab attention of your customer. Online food delivery services are all about offers you are providing to your customers. Social Media - Social media is one of the most influential tools to build customer loyalty for your restaurant business. You should add regular updates on social media. You can post professional photos of new specials on social media. You can include news about your restaurant that can impact users like awards you got etc. You should reply fast on customer’s comments. Loyalty programs - Loyalty programs are attractive features which you can add to develop customer loyalty. You can reward customers for their repeat orders by discount coupons and perks. With such rewards customer will be more intimate with your business. They will feel special by these programs.